A lovely picture that brings back many fond memories. At its peak, the trolleybus station was the terminating point for 5 routes; 517, 617, 521, 621 and 660. 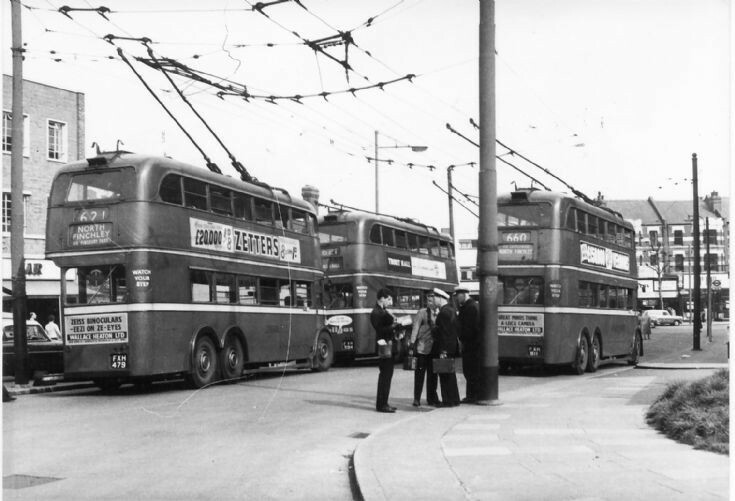 Two other trolleybus routes, 609 and 645, passed through North Finchley on their way to Barnet in the north and Moorgate or Canon's Park in the opposite direction. Sometimes they would be turned short and enter the terminus, bringing the grand total of routes to seven - a busy station indeed! The picture gives the date as 1962, but this can't be quite right, because routes 521 and 621 were withdrawn in November 1961. Route 660 was withdrawn in January 1962. Routes 517 and 617 were withdrawn in February 1961 and as there's no evidence of these route numbers in the picture, my guess is that it was taken in the summer of 1961. It could have been taken earlier than that, but not by a great margin. To the far left of the picture there are the letters AR on a shop front which are the last letters of WIMPY BAR, a well remembered after-school meeting place! My Father was a driver on the 609 and 660 up to the 50's and before that a tram driver. I have all his driving medals. He drove all through the war years in London. I used to go in the Wimpy Bar. Your Dad would have no doubt, been the driver of the bus, I and my friends were passengers on board. I have many funny memories of Saturday morning pictures at the Gaumont. I was one of the little sods your Dad would have shouted at.